Lindsay is one of my dental assistants. After working with us for a year, she saw all the smile makeovers that we had completed and wanted to make a dramatic change to her own smile. She felt that her teeth were too short, she did not like the spotting in the enamel, and was unhappy with the color. Being a young pretty girl, she wanted a smile that would get noticed. Lindsay was a perfect candidate for Lumineers. Lumineers are a thin additive type of Porcelain veneer. Her teeth were in good alignment, she had an overall consistent existing color, a flat profile to the teeth and good symmetry. She showed too much gum tissue in her smile and we knew we could use the laser to create less of a gummy smile and increase the size of her teeth. 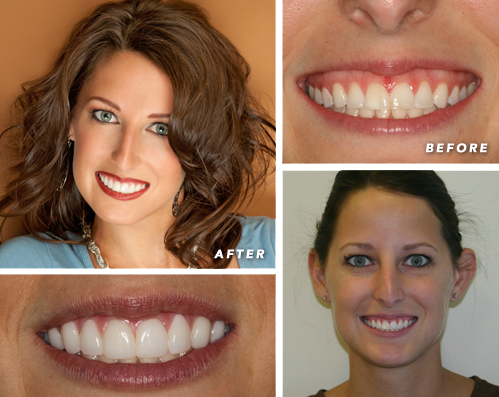 Lindsay is a perfect example of how beautiful simple smile design can make such a magnificent difference. We were able to address her concerns and make her smile look wonderful in a few simple appointments. Dr Troy Gombert is hands down the best dentist I have worked for. His exemplary skills are a true reflection of his meticulous attention to detail, his unequaled experience and his love for people. He was absolutely the only one I wanted to do my smile for me, and I am so thankful for his work. If you want perfection in dentistry, don't go anywhere else, Dr. Gombert is the ultimate!